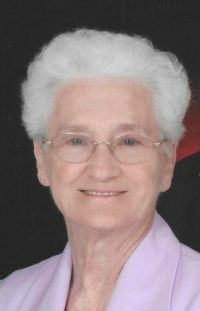 Mary Jane Reed, 88, of Galva, died Friday, October 12, 2018, at her home. Funeral services will be held at 10:30 a.m. Tuesday, October 16th, at the Galva Chapel of Stackhouse-Moore Funeral & Cremation Services. Rev. Jeffery Goard will officiate. Burial will be in Oak Lawn Memorial Gardens, Galesburg. Visitation will be from 5 to 7 p.m. Monday at the funeral home. Memorials may be made to the Galva Christian Church or the Alzheimer's Association. Mary Jane Connour was born June 23, 1930 in Murrayville, Illinois, the daughter of Vessie L. and Cora E. Luallen Connour. She was educated in Gilson area schools. Her marriage to Dewey R. Reed took place on September 4, 1948 in Knoxville, IL. He passed away January 18, 2013. Mary Jane was a homemaker and enjoyed spending time with her family. She was a member of the Galva Christian Church. Those surviving are a son and daughter-in-law, Ronald and Janice Reed, Oneida, two daughters and a son-in-law, Karen and Richard Hurlbutt, Galva, Gail Drawyer, Kewanee, nine grandchildren, two step grandchildren, 14 great grandchildren, and one on the way. Other survivors include a brother, Carl Connour, Galva, and a sister, Carol Wheeler, Ava, MO. Her parents, her husband, a daughter, Linda Carol, five brothers, a son-in-law, Rodney Drawyer, and a step granddaughter, Gwyn Drawyer, preceded her in death.